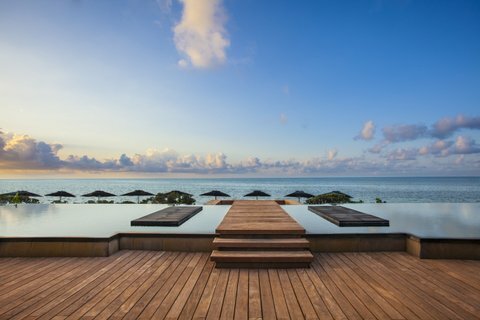 Nizuc Resort & Spa reveals a side of Cancun many people don’t know exists: A luxurious, tranquil retreat in a secluded beachfront setting. Good thing my taxi driver knew the way. It’s easy to miss the front entrance, which is veiled from the highly travelled Kukulcan Boulevard by mammoth wooden gates and dense tropical foliage. This all-new enclave of 274 suites and villas, surrounded by a lush 29-acre nature preserve, was built on the site of the former Mexican presidential retreat at Punta Nizuc. The original property was torn down in 2004 to make way for a hotel and condominium project, but the developer sold before making much progress. Luxury hotelier Las Brisas Hotel Collection stepped in and started from scratch, creating a contemporary Mexican ambiance that captures the essence of the ancient and mystical Mayan culture. 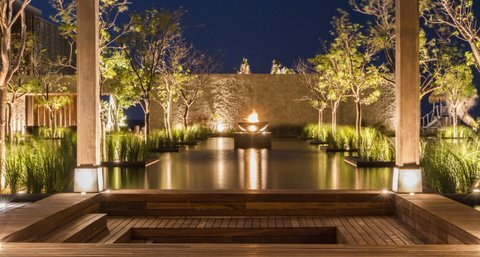 Architectural elements of stone, wood, water, fire and flora are artfully arranged to blur the lines between natural and crafted environments. The ocean floor seems to lap gently against the lobby floor, for instance, but it’s an optical illusion created by the intersection of natural topography and a man-made water garden. The guestrooms as well merge indoor and outdoor spaces. My oceanfront room, with its glass-walled balcony and upholstered lounge furniture, afforded unobstructed, lingering views of the Caribbean Sea, sugary beach and multi-hued sunsets. The distraction wasn’t too overwhelming, however—a king-size bed with Egyptian cotton linens assured my sound sleep. The bathroom was larger than many hotel rooms I’ve stayed in. There is a freestanding deep soaking tub and compartmentalized rain shower and toilet, and an abundance of thick, fluffy white towels. Wooden louvered doors camouflage plush robes and slippers, hanging and drawer space, and a room safe. The bath also was stocked with a complement of L’Occitane toiletries. The Nizuc-branded biodegradable mosquito repellent was a comforting touch, but I didn’t need to use it during my late August stay. Other perks are flat-panel television, Wi-Fi and Nespresso coffeemaker. Butler service is available to manage personal requests—a private dinner for two on the pier, perhaps? Or an excursion to swim with whale-sharks? The two additional guestroom categories are garden villa and residence suite. Garden villas have private street-level entrances and landscaped terraces with infinity pool, outdoor shower and waterfall. Residence suites, which can be configured into family-friendly sizes for larger groups, are flanked by the Nichupte Lagoon and the mangrove forest. Unlike most resort hotels, Nizuc has no buffet dining option. Instead, six distinctive restaurants, each with its own kitchen and executive chef, entice diners with a spirited array of global cuisine. At the open-air Ni, small dishes are instilled with bold Peruvian flavors. The Mediterranean-inspired menu at Terra Nostra runs from casual to elegant with wood-fired pizzas, handmade pastas and more. My personal favorite was the Chilean sea bass accompanied by tomato confit, herb sauce with pesto beans and spinach mousse. The four bars include a swim-up pool bar and a cigar bar. 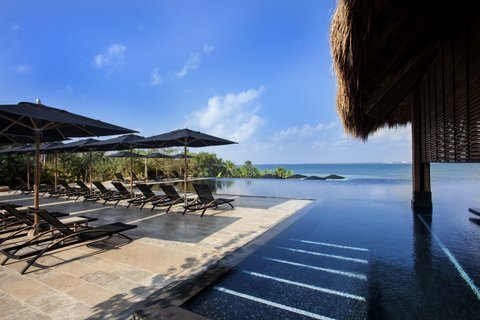 As for leisurely pursuits, among the myriad choices are two sprawling beaches and five swimming pools. One of each is reserved for adults only. Non-motorized sporting activities are available. For families, the Winik’s Kids Club provides entertainment for children ages 4 through 12. 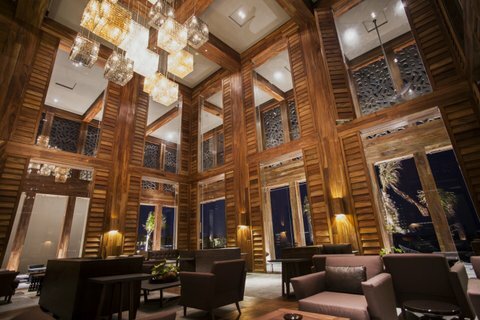 When it’s time to rejuvenate physically and spiritually, the 30,000-square-foot ESPA-branded spa, treats singles and couples to healing treatments and Mayan-inspired therapies. Complementing the spa are a full-service salon, professional-caliber fitness center and café. An upscale boutique sells designer goods—including an array of Pineda Covalin printed fabrics—as well as everyday essentials. The resort is a mere 20 minutes from Cancun International Airport. You’ll need a car or taxi to find the razzle-dazzle of the city’s renowned Hotel Zone, but that’s precisely the point. NIZUC is meant to be an escape from all that. In recent years I’ve shied away from Cancun and its round-the-clock beach party ways, but this stay definitely changed my mind. NIZUC offers an elevated guest experience that is IN Cancun, but FEELS like miles away.